For the past 25 years, America’s birthplace (Philly, of course!) has celebrated America’s birthday (July 4, of course!) with Wawa Welcome America – a multi-day festival of FREE multicultural and multigenerational events across the city. Never ones to miss out on a party, the Free Library is again happy to participate in the fun, with both the Rare Book Department and the Rosenbach offering free admission as part of the festival’s Free Museum Days, and another Brews & Views beer garden series headed to the Parkway Central Library rooftop! The Free Library’s Rare Book Department has one of the largest collections among America’s public libraries. The department’s latest exhibition, “In Our Nature: Flora and Fauna of the Americas,” includes historical texts and illustrations demonstrating human relationships with native and introduced species. It will be showcased from 9:00 a.m. to 5:00 p.m. on Saturday, June 30. Get your (free) timed tickets! Also on June 30, from 10:00 a.m. to 6:00 p.m., the Rosenbach will allow visitors to view important pieces of American history at no cost. The museum includes artifacts such as handwritten documents from George Washington, John Adams, and Thomas Jefferson. Timed tickets are available now! The Free Library’s beloved beer garden series will hit the rooftop for five consecutive nights from June 29 to July 3, from 5:00 to 9:00 p.m. Enjoy drinks on the Skyline Terrace and take in spectacular views of the city with local craft beers, wine, and refreshing cocktails available to purchase, along with a menu of snacks from Brûlée Catering. No tickets are required to attend. You may also join in the playful reading fun with book giveaways, read-alouds, coloring books, temporary tattoos, and more at four neighborhood libraries as part of Wawa Welcome America’s Citywide Read! Visit Donatucci, Logan, Haddington, and Lawncrest Libraries on Monday, July 2, 12:00 p.m.-2:00 p.m. to participate. Heading to the Welcome America Sand Sculpture Spectacular? Be on the lookout for a nod to a feathered friend near and dear to our hearts! 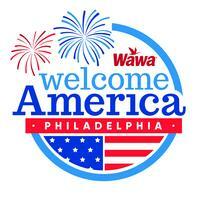 For more information on Wawa Welcome America and the full slate of celebrations, check out the official website! See you there! Join the Free Library for free museum days and a rooftop beer garden mini-series as part of the annual Wawa Welcome America festivities! Add a Comment to Join the Free Library for Wawa Welcome America Festivities!